Bookings are being taken now and there are deals for booking both courses. 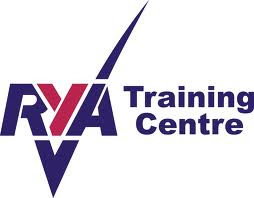 See the RYA page under the Training Drop down at the top of the page. A full information pack is available to download. Hurry, the Easter course is already over half booked! Only the brave (or foolish) ventured out this morning with a 20 mph South Westerly, gusting up to 40 mph. Even the SOOD went missing so Hugh stepped up to take his place and set a course of 4P 9P 8P 6S 7S and back through the Start. Not surprisingly there were only four starters, but as the boats went out it was decided that in the conditions one rescue boat was not enough for even these four boats so Paul R and Newton jumped into a second. They all sailed Lasers, but Adrian used a full rig (his idea of scaling down!) and the rest used Radial rigs. The capsize tally was David 0, Jon 2, Adrian 2, James 3+, but that might be an underestimation! As mentioned in the March newsletter the sale of the 10 abandoned trailers/ launching trolleys has started on Ebay. Please go to www.ebay.co.uk and search for either Dinghy Road Combi Base Trailer, and/or Dinghy Launching Trolley. All are sold as seen. Don't forget the work party tomorrow. Spades, pick axes/mattocks and muscles needed. It was a cold morning with a NE wind straight down the lake, about 13 mph gusting mid 20ies and the gusts were unpredictable in direction and strength. Ian C set a Tektona start up to Xp ( that white one) 5p 1s 3s 2p and back through the start. He took the wise decision not to sit on Tektona in the cold for an hour so set the finish near the club house. There were 12 starters and Newton & Ellen (RS200) managed to get to the first mark with a clear lead. David C (Laser) capsized to windward en route in a lull between the big gusts. Newton & Ellen were rounding 5 for the first time with a good lead when they were hit by a gust while jybing and went for a swim! Their mast got stuck in the mud and by the time they got it up they were at the back and the new leaders were long gone. At No 3 James (Laser) was in the lead until he hit the mark and had to do a turn. On the second lap Richard lost control in another big gust and capsized into the buoy line and it took him a lap to get untangled. Mark also flew into the buoys and lost time and James went for a swim on the way to No 3 (he obviously does not like this mark). By the end of the second lap David C was in the lead with Newton & Ellen back up to 2nd, Mark B (Laser) came through in 3rd and Hugh (Radial) and Hadey (4.7) were going well in 4th and 5th. A little further back James came through in 6th with Franz (Laser) 7th and battling away at the back of the fleet were William and Ben in their Toppers, who received the finish gun at the end of the lap. Adrian (Vago) and Chris H (Comet) had retired by this time. David C still led at the end of the third lap with Newton & Ellen 2nd and Hugh and Hadey up to 3th and 4th. By the last lap David C had pulled out a useful lead. Newton & Ellen were still 2nd with Hugh 3rd and James 4th. Mark was 5th with Hadey 6th and Franz was still going well in 7th. On handicap Hadey will take 1st place from David with Hugh 3rd, Newton & Ellen 4th, James 5th and Mark 6th. Well sailed to Hadey and Hugh and to the Topper lads who turned out in difficult conditions. Thanks to Ian C and the OOD team David M, Simon B, Ken P and Kate M.
Rescheduled work party this Saturday! Start 09:30. Key item on the agenda is the repair of the road. To add to the entertainment value, Mike the Bosun has arranged equipment in terms of rollers, compactors. If you are willing and able to be apart of the road gang, your efforts will be very much appreciated ! Please bring garden rakes, tampers, spades (not shovels) to put edges on the holes. For the less energetically minded there are other jobs as well. Learn to Sail a dinghy this year! Open to all members. New members welcome. A bit frisky this morning with a 16 mph South Westerly and some stronger gusts coming through. David C set the first beat down to 4P then 2P, 5S, 8S, 9S, 6S, 7S and back through the start. There were 11 starters, Alistair S rigged his Laser with a furled main sail but did not actually start. Not surprising as it is difficult to get the furling tight enough to give a decent sail shape. All of the other Lasers were flying Radials although many were nominally sailing off the full handicap rating. Ian still led at the end of the second lap, but Richard S had moved up to 2nd with Hadey 3rd, Curtis 4th and Mark who had a bit of an incident near the buoy line down to 5th. Mike A and Chris H were still together in 6th and 7th places. On this lap we lost Adrian and Steve both capsized at different points. Steve had capsized eight times but kept going until he finally inverted his boat completely at No 7. The third lap leaders were the same three boats with Mark making up ground (or should that be water!) in 4th place. Curtis had disappeared after close contact with the bank lifted his rudder off the pintles. Mike A, after four capsizes including a double, decided to retire when he saw the leaders starting a fourth lap and thought that was not for him. Chris H received the finish gun at the end of this lap. On the fourth lap Ian capsized at No 5 and then so did Richard. This allowed Mark to come steaming through and he crossed the line in 1st place with Richard recovering to 2nd and Ian crossed in 3rd with Hadey, a very creditable 4th. On handicap it looks as if Hadey was close enough to take the overall victory, so well done Hadey. Thanks to David C and the OOD Team, Jon, Mark, Sam and David and to Roland L and Hugh who went out in another rescue boat. It was a terrible start to the morning with hardly any wind and a heavy persistent drizzle, but fortunately by the time of the start the wind had picked up to about 10 mph SSW and continued to increase during the race. Mike A set the first beat down to 2 then 4S, 9P, 5S, 8P, 6S and back through the start ( avoiding the use of No 7 as requested by Hadey !) There were 15 starters, which was very good considering the conditions. Newton & Ellen (RS200) were leading at the end of the first lap and continued to do so for all four laps of the race, although they could never relax as Ian C (Supernova) and Richard S (Laser) pressed them hard all the way. After these leading three had passed through there was a slight gap to another closely contested pack consisting of the Lasers of James, Rod, Ken and Rick and the Byte of Roland S. Next through were Hugh (Radial) and Alistair S (Laser) with another gap back to Chris H (Comet), Curtis (Radial), Hadey (4.7) and Adrian (Vago) with William gamely chasing these in his Topper. By the end of the second lap Ian had just pinched 2nd place from Richard and the next four places remained the same, but Hugh was going well and had managed to get past Roland. Further back Hadey and Adrian had moved up one place by passing Curtis who seemed to be struggling today. After three laps the leading seven positions had not changed but there was really close racing between the first three and then between the next group from 4th place to 10th place. Rick continued to go well in 7th place and Roland had retaken Hugh with Alistair S in very close attendance. Adrian had moved up two places by passing Chris and Hadey. William received the finish gun at the end of this lap. At the end of the fourth and last lap there was a photo finish with Newton & Ellen just winning by a nose (or a prow) from Ian with Richard 3rd. James was still 4th but Ken had managed to get past Rod to take 5th place. Unfortunately Rick who had held a steady 7th for most of the race capsized on the last lap and dropped to 10th, which let Hugh through into 7th, Roland to 8th and Alistair S to 9th. The increasing wind seemed to refresh Curtis and he passed Hadey and Chris but could not catch Adrian. 1st Newton & Ellen; 2nd Ian; 3rd Richard; 4th James; 5th Ken; 6th Rod. On handicap Richard will pip Ian for 2nd spot with Roland moving up to 3rd and Chris up to 5th. Thanks to Mike A, Neville, Sylvia and Peter S and to Roland L and Dave I who also helped with the OOD duties.